Build a structure from the frame and roof to the cabinets and counters. Work from plans and specifications to build new buildings and remodel existing ones. Students will frame and complete the exterior of a structure. They will also complete the interior and then construct and install cabinets and counters. Tech’s new curriculum provides instruction on the installation of solar panels and wind turbines. Carpenters work outdoors as well as indoors and should not be afraid of heights. Safety rules must be followed outdoors and in the shop. Hand tools and power tools are used. Advancement will require additional training and education beyond high school and/or experience. 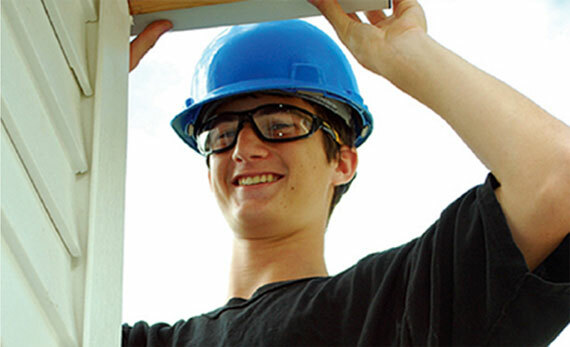 Students must successfully meet the academic and attendance criteria for a two-year Wilson Tech Certificate of Completion, be High School diploma eligible, and pass the following national certification exam: National Center for Construction and Education Research (NCCER) Carpentry Exam. Scott Bernstein is a NYS-certified instructor who holds a Bachelor of Science in occupational teacher education from NY Institute of Technology, and is also NCCER-certified. With a background in mechanical engineering, he has worked as a carpenter for several high-end residential remodeling firms on Long Island and is well-versed in all phases of construction.